We (Harriet and Catherine) attended the Museums Computer Group Conference, UK Museums on the Web 2013 on 15 November 2013 at Tate Modern. The evening before we boarded the bridge of the Tattershall Castle and presented an Ignite-style lightning session about Play Your Part. We had 20 seconds for each of our 20 slides to condense the main findings of the project so far. ON A BOAT!!! The slides sped past, but we had a great time and it was great to start disseminating some of the work we’ve been doing to colleagues from across the UK. It also meant we could then relax for the rest of the conference! The conference itself was very interesting, and fortunately steered away from overly technical presentations that we feared would go over our heads. The theme, ‘Power to the people’ ensured that the focus was on communication, communities and crowdsourcing, topics which have given us food for thought for Play Your Part. – The Curate a Fact game where delegates had to create collections out of cards we were given. This gave us an opportunity to talk to more people than you would usually approach at a conference tea break and we met lots of interesting colleagues! – Hannah Freeman from the Guardian speaking about Open Journalism and the importance of asking your audiences direct questions to encourage good quality contributions. This is something we’ve discovered during Play Your Part – specific questions get more engaged answers. – Nicole Cama from the Australian National Maritime Museum explaining how they’ve used Flickr Commons to encourage their digital communities to research their photograph collections and some surprising success stories. She stressed the value of nurturing your online communities. One slight criticism of the day was that it needed to be more practical. We would have appreciated a more workshop style approach that would have allowed us to delve deeper into some of the themes and apply findings from the informative case studies to our own practice. 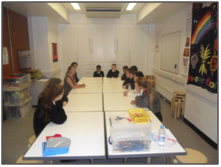 There was a lot of sitting and listening, which doesn’t suit every learning style and we felt that this could have been mixed up more in some really creative ways. 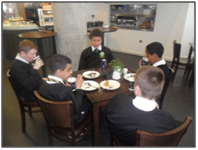 The talks were however broken up by a plethora of tea breaks and we were definitely spoilt by the catering on offer! An added bonus was getting to sneak up into the Tate Modern at the lunch break and see some favourite paintings (Rothko’s Seagram Murals). Allan Sekula’s Waiting for Tear Gas was another highlight and featured powerful images of protest. Our changing exhibition The People’s Business – 150 Years of The Co-operative is in full swing at the moment. To complement it, we are putting on a conference here at the museum on 25 January 2014 – a Saturday. Called 150 Years of the People’s Business, everyone is welcome, and we have put together an excellent bunch of speakers talking on a wide range of co-operative-themed subjects. For example, from the Co-operative Archive we have Dr Rachael Vorberg-Rugh talking about women and the co-operative business model; and Gillian Lonergan will talk about the CWS 1941 promotional film Behind the Counter (and we’ll show the film too). David Stewart and Angela Whitecross from UCLan will look at the Co-operative Party from 1917 to 1997. We have talks on co-operative buildings and architectural heritage, by Stephen McCusker from the Loop Systems Architects Co-operative, and our former director Nick Mansfield, now a research fellow at UCLan. There are also talks on the business networks of the CWS, by Prof Tony Webster of the University of Northumbria. John Wilson from the Newcastle University Business School will then suggest some lessons to learn from the Co-Operative Model. And Russell Gill from the Co-operative Group will talk about how it (the Group) can use its heritage to shape its future. The day will also include a guided tour of our exhibition. The full programme of the day is here. We’re starting the day a bit later (10.30am) because we’re told an earlier start time is not suitable for people travelling from afar. There’s so much to cram in, though, and we finish at the museum’s closing time – 5pm. We’re trying to keep the cost of the day down, and will charge £25 for the full rate and £20 for concessions. These need to be bought in advance online (http://peoplesbusiness.eventbrite.co.uk). Tea, coffee and biscuits are available at the start of the day. The best place for lunch – not included in the fee – is the Left Bank Café based within the museum. We hope the themes and speakers will appeal. And of course, there are the wonderful – and free – permanent galleries to browse through. A busy day! Hope to see you here. One of the joys of working on the Play Your Part project is the opportunity to go out and learn from inspirational colleagues across the country. We’re currently starting to think about the contemporary collecting strand of the project and I wanted to find out more about two similar projects that are collecting activist heritage. Preserving Protest at Bishopsgate Institute in London aims to capture the digital archives and websites of contemporary campaigning organisations. Library and Archives Manager Stefan Dickers explained how at Bishopsgate they’ve identified a collecting niche of contemporary material. He’s found that organisations and individuals feel more comfortable donating material to an independent institution and he’s actively gone out and approached some of the many community groups around London. Initially there wasn’t a concerted plan and the collecting policy has evolved. They’ve focused on London-centric organisations and have stressed that it doesn’t have to be about the ‘big people’, ordinary people’s campaigns are just as important and they have an openness to everything. The Preserving Protest project specifically looks at collecting digital material, for example photographs and capturing activist websites. Whilst some paper material has been offered as well, the activist archives have been predominantly digital. For example, the Occupy Movement have donated four terabytes of material. At Bishopsgate they are looking at creating an online pool, where groups can drop in digital material and provide metadata about what they are depositing; essentially crowdsourced cataloguing. Currently, our collections policy doesn’t include the collection of digital material. With organisations and activists increasingly campaigning online, photographs of protests predominantly taken with digital cameras and the decline of print media, this is something that will need to be considered as we think about a contemporary collecting strategy. Stefan also discussed some of the events and engagement work they have done using their contemporary collection. Trenton Oldfield, the boat race protestor, often uses the library and he has donated his archive, including his wetsuit. At an event with schoolchildren they used Trenton as a ‘living object’ and the children had to guess who he was, based on ‘yes’ or ‘no’ questions. Another project (with the best project title ever! ), The Only Way Is Ethics was a youth-led Heritage Lottery Funded, project in conjunction with Emergency Exit Arts and the Museum of London. It focused on the heritage of democracy and social activism by exploring the ethics of protest, ethical choices (including personal and political responsibilities) and the ethics of museums, archives, curating and record-keeping. Stories of Activism in Sheffield is a collaboration between local activists and campaigners and academics from the Centre for the Study of Democratic Culture and the Centre for Peace History from the Department of History, University of Sheffield. Over the course of several years, the project will collect and archive campaign paraphernalia, and perform interviews with activists. Starting in around 1960 and continuing up the present day, the project aims to incorporate a diverse range of people and experiences into the project. I met with Gary Rivett who explained the background and future of the project. The project idea started in 2011 when they put on a one day event about stories of activism in Sheffield, which was originally intended as a standalone event. They found that activists were interested in having their stories collected and the event provided the initial start for a broader project. Over the next six months they put together a working group of activists, who met in each others front rooms to plan the next, activist owned, event. From this, they set up a steering group to identify partners and Gary is just about to submit a HLF bid for the next stage of the project. It will be a two year project with a BME strand and a women’s strand, bringing together stories to produce outputs such as a book and a play. The project has a constitution which states that at every stage activists must be involved in developing the project. They were keen on building up relationships, building trust and learning from activists about Sheffield’s history. Whilst the project collects oral histories and objects and deposits them in Sheffield Archives and Sheffield Museum, the stories are collected not just to be stored, but to inform people of campaigns and organisations that are now taken for granted. They have disseminated stories of activism to new audiences, by using the stories to develop a city activist walk. They have responded to what the activists wanted in terms of how the stories are used, whilst being open and recognising that all stories may not be used. At the beginning of the project they got funding to do a scoping study and employed a researcher to research activist groups in Sheffield over the past 30-40 years and identify individuals to approach. That researcher is now doing a PhD into activism on behalf of marginalised groups in the 1980s. They have also set up a masters course at the University of Sheffield called stories of activism, which aims to develop research from the stories and objects collected. Both Stefan and Gary highlighted the importance of building relationships and trust with activists and the fact that activists can be well networked. Activists are often connected with different groups, and once the word of the project gets out, then more groups are keen to get on board. For example, Gary explained that it took them nine months to get to a critical mass of activists, and contributions snowballed from there. General calls for material weren’t that successful, it was only by contacting activists directly, attending meetings and building relationships that the project progressed. They also stressed the need to let groups know that what you are doing is important. Organisationally, we now have a lot to ponder, especially when setting the parameters of the groups we will approach. Geographically, it makes sense to focus on Greater Manchester organisations as it will practically be easier to attend meetings and build relationships. However, as a national museum should we be casting the net wider? We also need to decide on which sort of groups to approach. Many of the campaigns we cover in the museum are leftwing, so, for balance, should we be collecting rightwing material? Would collecting material from, for example, the English Defence League appear to legitimise an organisation that on a personal level I find abhorrent, or is it important to preserve this element of history so future generations can have a fuller picture of what life was like at the early stages of the 21st century? We already hold material from the British Union of Fascists in our collection, which we use in our galleries to illustrate the opposition between fascists and communists in 1930s Europe. We need to consider what visitors of the future may learn from material we collect now and be objective in separating personal beliefs from professional decisions. We returned to the Grant Museum of Zoology earlier this month to meet with Jack Ashby, Museum Manager and Claire Ross, PhD researcher, to discuss how the museum has used Qrator to engage with their audiences. The Grant Museum moved to a new building two and a half years ago and they wanted to incorporate visitors’ voices into the displays. As part of UCL, the Grant is often used as a test bed for different projects and researchers ideas, and Qrator was formed based on one of Claire’s ideas, that when visitors come to a museum they want to participate. They started off using QR Codes and Tales of Things in order to gather visitors’ voices, however, this was unsuccessful as visitors’ stories about natural history collections are not that interesting and aren’t really alternative voices. Qrator addressed the need to get visitors voices onto objects by posing questions about the displays and the function of the museum, rather than the objects themselves. Jack focused on the content side and came up with questions, whilst Claire researched the audience engagement and usability side of the project. The team at the Grant decided to ask questions that would inspire answers that really informed the research done at the museum, in order to inform their own practice, but also to spark ideas from visitors that they may not have thought about otherwise. Each question has four levels of interpretation: a title; the question; a 60 word introduction that frames why they’re asking the question; and the visitors’ responses – how other visitors have answered the question. The original intention was to change the questions every two months and give feedback of what visitors thought and what the museum would do with the information shared. In practice, it was too hard to analyse the data and it was difficult to condense visitors’ responses- some engaged but didn’t come to a clear cut answer. Next time, the team indicated that they would not include sub-questions in the 60 word introductions, as some visitors were confused as to which question to answer. 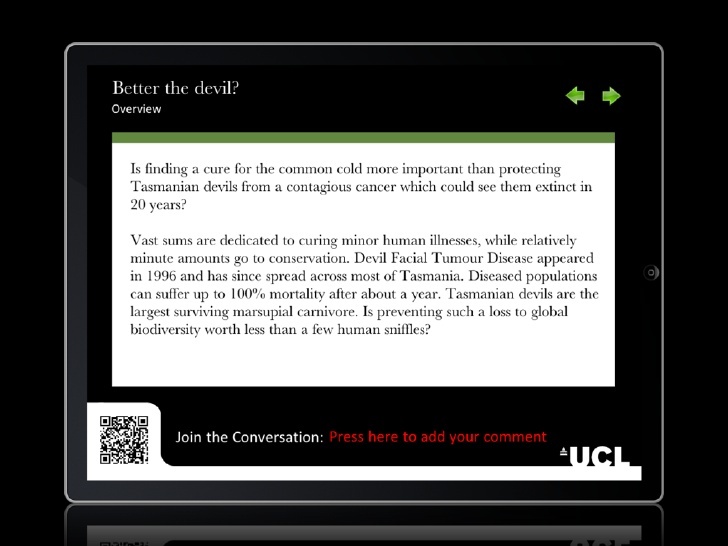 Another issue was that the headings are the only thing you see on screen when typing your response, so visitors often just responded to the headings, for example ‘Humans vs. Animals’. The uptake has been very successful, with one in three visitors leaving a comment. There has been a high uptake of on-topic comments. Comments fall into three categories: those responding to the questions; general museum notebook comments; and visitor ‘noise’. All comments are posted live, with a small bit of post-moderation and there is a swear filter. 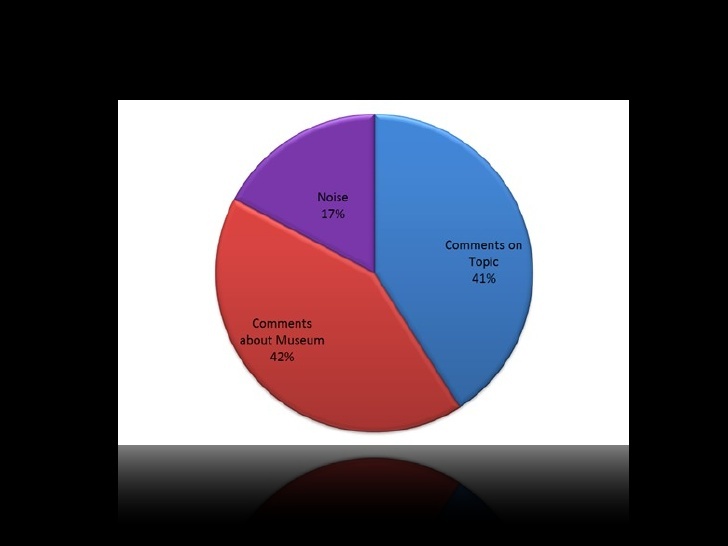 It takes around 15 minutes a day to moderate the comments, which is done by the visitor services staff. One issue us that if you delete something from the system, it disappears completely and consequently there are no records of how many comments have been removed either by the swear filter or by visitor services during their moderation. Visitors can also comment on Twitter, using QR codes in the museum and on the website. However, if you tweet it comes up on all the iPad’s, so they can’t collect the comments along with their relevant questions. Every week the museum tweets a couple of comments which is very successful, and gets a considerable amount of response. The use of the QR codes has been less successful, the presence of the iPad’s means that there is little reason for visitors to use their own devices. They have also found that it’s rare for users to contribute on the website. Recently, we went over to the Imperial War Museum North to have a look at how they approach digital interaction in their galleries. 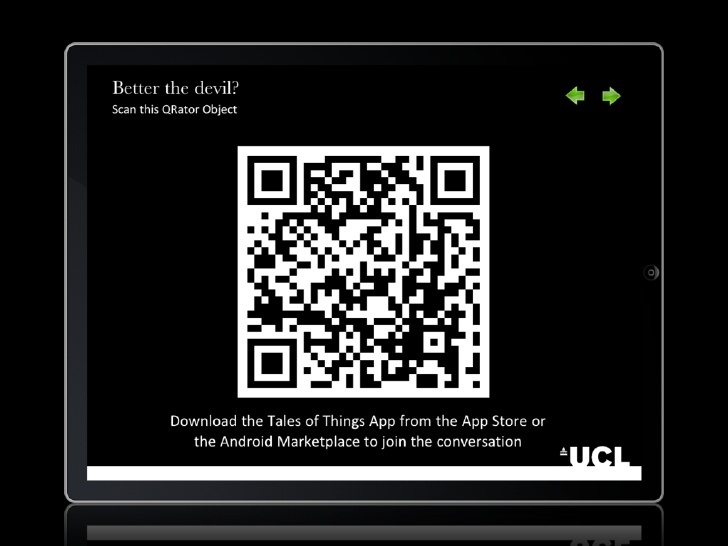 In one example, visitors were faced with QR codes next to certain objects, upon scanning; they were invited to download an app which then allowed you to comment on the object, answering a specific question related to that object. This, in theory, we thought was a great idea. But if you don’t have a smartphone, or didn’t want to spend the time downloading an app or QR code reader, the barriers to access proved to be too great. For this reason, we feel Qrator is a great way for visitors to respond to our displays and questions in the museum- the iPad is ready to be used, so the barriers to access are minimal. In order to remove barriers to access the Qrator team purposefully didn’t ask for visitors’ names as research has shown that this seriously decreases the number of visitors willing to participate- only 1 in 100 will access when faced with this barrier. As an added design feature, the team wanted to have threaded comments but this didn’t come about due to time restraints. 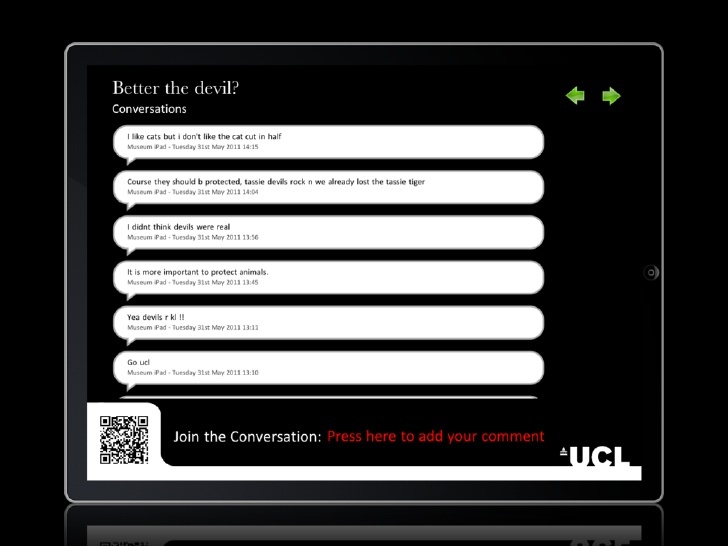 However, Claire Ross did a similar project at the Imperial War Museum and found that visitors didn’t use threaded comments – people don’t mind responding to their friends but they don’t like doing it to other visitors. 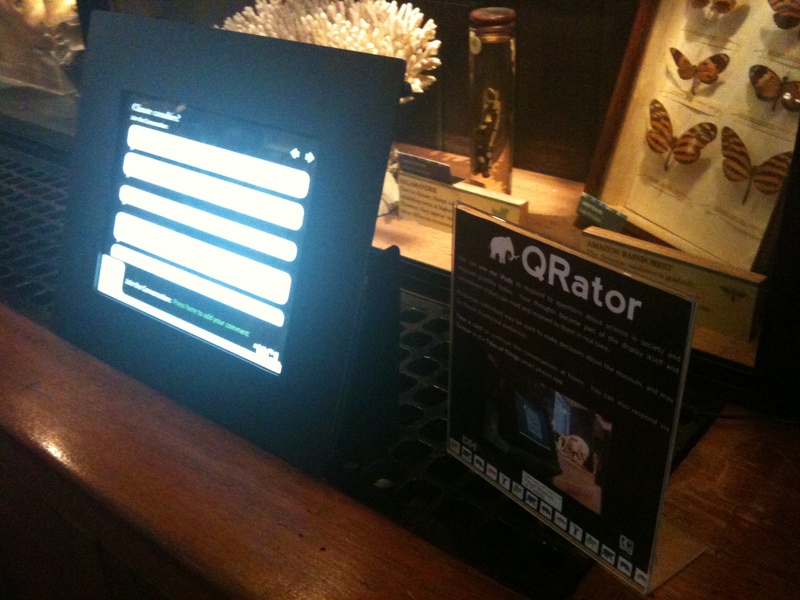 Qrator was designed so that it wouldn’t detract from the displays if visitors didn’t want to use it. From visitor observations, they noticed that of those that do stop, some just want to read other visitors’ responses, and some want to comment. Those that comment spend around 2-3 minutes and mostly it is a social experience, with groups of people using them, pointing at objects and commenting. One interesting point is that one iPad is getting twice as many comments as the others; the team at the Grant aren’t sure if it is because of the location of the iPad or because it is a very engaging question. When considering the technological aspect of the project, Jack and Claire spoke about the problems surrounding iPad’s, including the fact that they need to be updated every year- for this reason, a touch screen PC might be better option. This is something that we need to consider for our project, especially with regards to future-proofing and sustainability. During the course of our discussion, we had a bit of a light bulb moment as to why our experiment using post-it’s in the galleries had been unsuccessful. Claire and Jack mentioned that they also use Qrator at the Museum of Brands, which, like the Grant Museum, doesn’t have much labelled interpretation and therefore makes the iPad’s stand out. Visitors need space to think about the questions brought up during the museum experience, so Qrator have deliberately placed the iPad’s where there’s not much other interpretation. We have found that we’ve had strong responses outside our galleries (where there is space to think), but not in the galleries (where there is a lot of other ‘noise’ with interpretation panels, objects and labels). This is something to consider throughout the our Play Your Part project. The first Monday of every month brings a lunchtime Snapshot session in the archive down in the museum’s lower level. It’s an opportunity for anyone to have a look at a selection of some of the 80,000 photographs in our huge collection from the Labour Party and Communist Party archives in a friendly and informal setting. 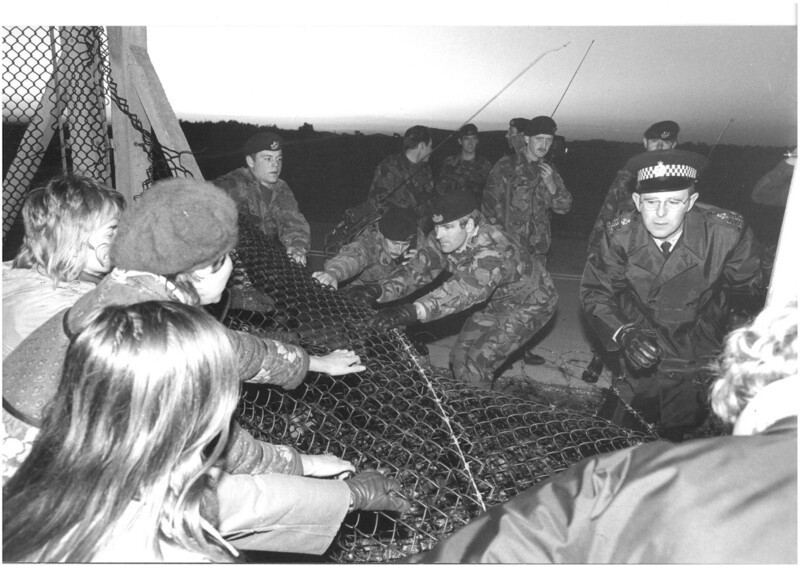 On Mon 2 Dec Snapshot focuses on Greenham Common and other peace camps. 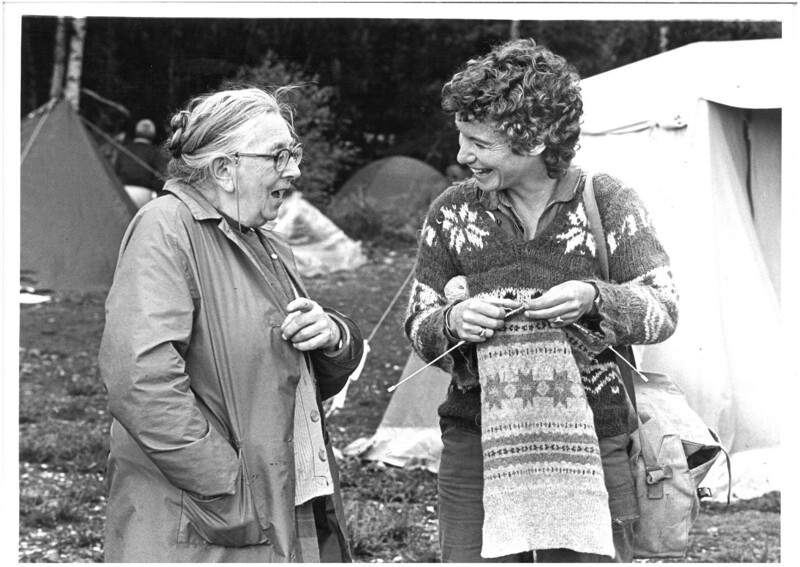 Greenham Common Women’s Peace Camp was established at RAF Greenham Common in Berkshire in 1981 to protest against the British government allowing Cruise nuclear missiles to be located there. There was a constant presence of peace campers living permanently or temporarily at the base. Mass demonstrations took place in April 1983, when 70,000 protesters formed a 14 miles human chain to the Atomic Weapons Establishment at Aldermaston, and in December 1983, when 50,000 women encircled the base. 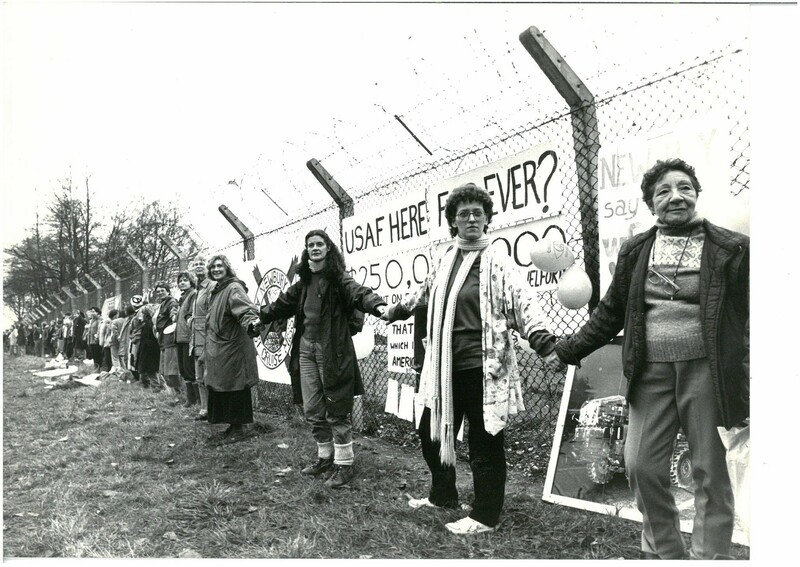 The last missiles left Greenham in 1991, but women remained at the site until 2000 to protest against the U.K.’s Trident nuclear programme. There were also peace camps at Upper Heyford and Molesworth, among others, and they too form part of our collection. Snapshot sessions last from 12:30pm – 1:30 pm on the first Monday of every month (except January). There’s no need to book; just come along. A 15% in the museum cafe is available to anyone who attends. 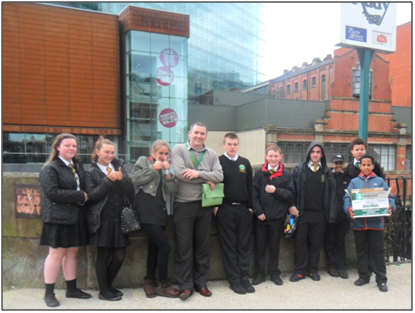 On Thursday 4th July we went to the People’s History Museum (PHM) in Manchester with Mr Windle and Miss Eyres to learn more about solidarity, how to get along with people and to produce our own banner for International Evening. This involved working with John Halligan from the Trades Union Congress (TUC) and Annette Cobley, the museum’s artist. The first thing we did when we got to the PHM was to go to the Learning Studio where Annette gave an introduction about the museum. We then had a tour of the museum galleries and learnt about banners, why they were there, and what the symbols on them mean. Some of the banners we looked at were made by the bricklayers’ union, the Labour Party and George Tuthill. After our tour we went to the museum’s café for a cake and a drink, before going back to the Learning Studio to make plans for our banner. We worked together and all got our points across about what should go on our banner. 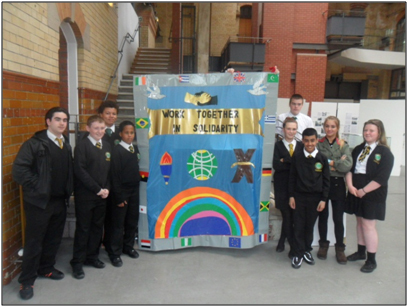 Going to the PHM was a very good experience because we learnt how to all work together, how to get our points across better, how to make a banner and how solidarity can help our careers. Before our visit to the PHM we worked with Mr Windle to learn about solidarity in Cuba and with Jay McKenna from the TUC to learn about what trade unions do. Our visit to the PHM was also funded by a trade union called Unison. Our plans for the future are to carry on working with the TUC and Unison because we want to learn more about trade unions, take part in a community radio project and hopefully even go to some places around the world like Cuba or Nigeria so we can see how other people live. If you have been down to the museum recently, you will have noticed that we have a new changing exhibition. The People’s Business – 150 years of The Co-operative opened on Sat 12 Oct and runs until Sun 11 May 2014. As part of our events programme this coming Saturday we have a whole host of activities for you to get stuck in to. Find our more below, both about our events and the exhibition. This year The Co-operative turns 150. 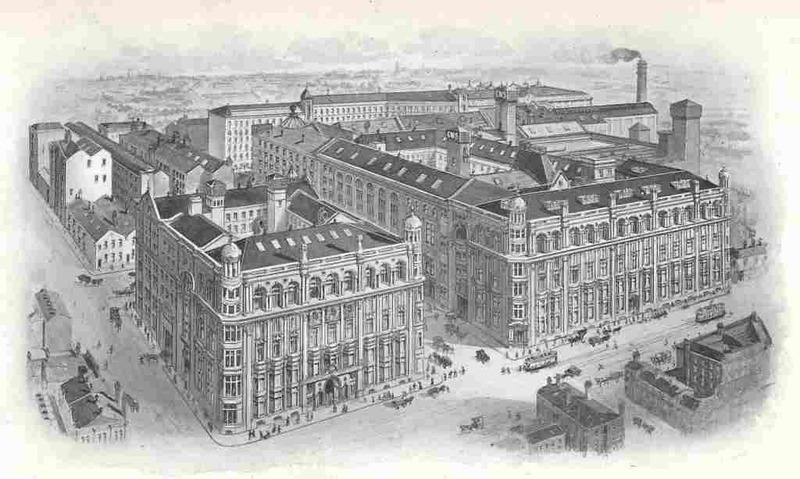 For 150 years The Co-operative has grown to first manufacture and then to sell products. Its services continue to support the families and communities of Great Britain and the world ‘from the cradle to the grave’. This people’s business began its humble origins as the Co-operative Wholesale Society in Greater Manchester in 1863. The exhibition explores the story and values behind the ‘caring sharing co-op’ and offers a unique insight into the way we shop and live. Over the Members’ Weekend, there will be a series of events in addition to the exhibition The People’ s Business – 150 Years of The Co-operative to enjoy with all the family. This includes a number of bookable and drop in events taking place on Saturday 9 November, with some being repeated on Sunday 10 November.